The new club formation started mid 1994 with a visit from District Governor Mary Kincaid, Eleanor Stewart S O M chair, and some Zontian friends. Donna Goulter, Bridget Orman and Leone Ward with the Club’s banner gifted to the new club from the Zonta Club of Marlborough Area. At that meeting Eleanor Stewart was accompanied by Area 3 Director Kate Lovell, June Bell from the former club, as well as Dr Jacqueline Rowarth, recipient of a Zonta award for science. A video about Zonta was shown and Jacqueline spoke eloquently about her achievements, Zonta and the award process. A decision was made and the Zonta Club of Marlborough was formed late in 1994, with meetings commencing in February 1995 and chartered 1 July 1995 with SOM Eleanor Stewart smoothing the path. 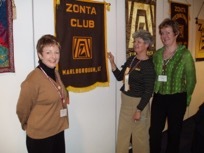 Three members of the previous club (Zonta Club of Marlborough Area) chartered with the new club. Over the years, Zonta Club of Marlborough’s membership has fluctuated substantially, from an initial 28 founder members to a short period when there were just 12. However, in spite of that the club has always operated in good heart, with enthusiasm. Most of the resignations have been because the member was moving out of the region, had difficult health issues or new/ changing job commitments which meant time restrictions. Previous Zontians have always been willing to support our fundraising and enjoy receiving the newsletters to keep up to date with events. A membership initiative : IWD brunch had a flyer at all places inviting interested women to be at a brunch a month later. Members also canvased friends and acquaintances so had five seriously interested candidates as a result. Judith Bythell and Bridget Orman are the two remaining foundation members and this year, 2015, celebrate 20 years in Zonta. Fundraising is an integral part of the club’s activities. There are three levels of concern for District 16 Clubs, local, national and international. Zonta’s prime mission to raise the status of women guided the local cause chosen for funding by Marlborough Club. Selection is based on the premise that it helps women to achieve educationally, economically, and socially. Marlborough Hotel: Dinner and Auction ($14,000 raised!) Sept 1997 to enable the Angel Fund to set up. Z Club started at Marlborough Girls College (MGC). Continued for two years. 2002-2004 Books purchased for use by Literacy Marlborough’s students. Christmas packages gift wrapped for mothers in Women’s Refuge – annually. Ladies Day Out with Zonta – a pamper day with Chryssie Russell (dressing with style and line), Arthur Devine (hair design) and other related providers. Migrant Centre Newcomers Group – day out in Marlborough Sounds to Mistletoe Bay Eco Camp partnered with Spring Creek Lions. 120 migrant mothers and children on Beachcomber vessel, sausage sizzle, games and sports. Hosted MGC event when Dr Donna Swift reported on The Girls Project. (Re increase in violence of girls – how and why). Helping at the Cancer Society’s Daffodil Day with a roster of members at Mitre 10’s stall. Marlborough Sounds Weekend Retreat at Joy Cowley’s place. Relay for Life for the Marlborough Cancer Society – Zonta Zest teams in 2004, 2006. Zonta’s tent at Relay for Life, walkers relaxing waiting for their next turn. Spring walk for UNIFEM – annually on a Sunday in September for projects in the Pacific. Annual January picnic – Marlborough Sounds (Bythell’s Beach) and elsewhere for Zontians & Hon Zons! John’s Kitchen at Crossroads welfare drop in centre: Zonta teams prepared, served and cleaned up for the Wednesday evening hot meal for charity. Lots of chatter along with the work! Garlic Shed Movie Theatre – local enthusiastic projectionist shows a movie of our choice to enjoy with food and beverages in this small character venue. 10th Birthday party 2005 – a black, white and gold theme. Invited guests – Zonta’s District Governor, Maxelyn Tudman, attended along with the Mayor and Mayoress Alister and Thelma Sowman. SOM Eleanor Stewart, club members and their husbands. An enjoyable and successful evening with addresses from the Mayor, District Governor, SOM and President, which celebrated 10 years of community involvement and projects dedicated to helping women. Our first big fundraiser – The Garden Party at Rapaura March 1996 This was a hat party, hats must be worn, and hats from celebrities were to be auctioned. Zontian Lesley Cole auctioned off the celebrity hats amidst much amusement and a well used hat from Barry Crump fetched the best price. Mayor Liz Davidson presented prizes for the best and most original hats, finger food was served, artist Clarry Neame was painting a picture in the garden, a string quartet played music, members gave rides in two beautiful old veteran cars. In 2002 a St Patrick’s Day themed event at Gillan’s Winery raised over $3000 for Adult Literacy. There was “Father O”Malley” who heard confessions, an Irish dancing troupe, a silent auction, kissing the “blarney stone” and other such fun, out among the cherry trees in the courtyard. Much merriment amid the serious fundraising of both an auction and a silent auction. A movie night premiere In 2010. Gaylene Preston’s movie Home for Christmas was our opportunity for a real premiere! Gaylene herself was also on the same night at a premiere on the West Coast as that was where the movie was set. We had one of her producers to speak on her behalf at our occasion. It was a sell out glittering gala affair. The movie theatre owner dressed as Winston Churchill complete with big fat cigar, mingled with the crowd, the elderly women from a local retirement village who were young women of the era, arrived in a white limousine and were escorted up the red carpet by uniformed airforce personal from Woodbourne Defence Base. Music from the era was played in the foyer such as Vera Lynn’s “Blue Birds over the White Cliffs of Dover”. Zontians provided pre-movie food as from the forties to the theatre goers – dainty cucumber sandwiches, asparagus rolls, club sandwiches, lammingtons and Christmas cake etc with a glass of wine to wash it down. This was a huge success and funds raised exceeded any previous Zonta movie night. Patricia Robins: a trail blazer in the Anglican Church. After many years as a teacher, Pat became the first woman ordained as a Minister in the Nelson Anglican Diocese. Pat was also instrumental in forming Literacy Marlborough which aimed to assist adults to achieve literacy. Jane Symonds: a scientist working in aquaculture with the salmon industry in Marlborough. Lynda Neame: a scientist working with the Marlborough District Council, responsible for the quality of water and atmospheric conditions. Joy Cowley: well known and respected author noted for children’s books. Joy was recognised with honours, OBE, DCMNZ. Liz Evans JP: former national president of Rural Women NZ received NZ honours ONZM for services to rural women. June Bell and Barbara Fenlon attended Paris convention 1998 after tripping through Italy. Bridget Orman attended Melbourne 2006, and Rotterdam 2008. The object was to provide small interest free loans to women who were seeking to improve their business skills or education and did not have access to conventional loan sources. A fundraising auction achieved $14,000 which made sure that there was a good funding base. The Women’s Loan Fund provided $5000 for a contingency fund which was put onto fixed deposit. After a couple of years it became obvious that the Angel Fund needed to be put on a more secure footing so The Angel Fund Trust was formed in September 2004. The majority of Trustees have to be members of Zonta Marlborough. A part time administrator was appointed on an hourly rate. Over the years there have been many applications for loans, ranging from small amounts of $100 through to the maximum given of $500. The loans are given interest free and on trust that re-payment schedules agreed at the time, would be met. Generally the amounts have been repaid promptly. Some applicants have returned for a second loan to help further their business expansions or further education qualifications sought. A special project to celebrate the International Year of the Elderly was to produce a book. This contains the stories of several interesting women each chosen by a Zonta Club member. We had the help of Archives NZ who provided us with information on how to interview, what facts were essential, what was of interest, and what was important to obtain from an archival point of view. The women all had to be 75 years or older and ready to give their story willingly. The stories were published and bound in a booklet with an ISBN number from the National Library of New Zealand. Each of the women involved was presented with a copy of the book at a morning tea to which they were all invited. June Bell and Paula Bayley spent all afternoon getting exhibits ready for the Auction which was to raise money to start the Angel Fund. Dashing home to wash and change for the evening event, then describing items as they were held up for auctioning. By the end of the evening they were starving and Zontian Jenny McAuslin (McDonalds franchisee) offered them vouchers. So at midnight our two intrepid helpers were busy scoffing Big Macs! Job well done. The proceeds from an annual fundraiser at the movies were used to establish three scholarships for young women to be used towards tertiary fees. The criteria were set at all three to encourage applicants who through their life circumstances were disadvantaged financially and wished to improve their economic position through tertiary education. [read more=”Read more” less=”Hide”]Scholarships were established in 1997 with Marlborough Girls College, $500, Queen Charlotte College (Picton) $500 and Nelson Marlborough Institute of Technology (Blenheim campus) $500. In 2010 the NMIT scholarship was increased to $750. The purpose of this award was extended to allow for part time study. This would give an opportunity to a woman who was unable through family or other commitments to study full time. The former Zonta Club of Marlborough Area had previously instituted the Zonta Cup at Marlborough College which later split to become Marlborough Boys’ and Marlborough Girls’ Colleges. The cup was awarded to a senior student both boy and girl, “for service to others” along with a good quality dictionary. Since the proliferation of electronic devices used in the schools for word searches, this has been changed for a $50 book voucher to accompany the Cup. Discussion at the 2014 AGM in November was about how we could celebrate Amelia Earhart Day since it fell in early January when the club was in recess. The suggestion that we establish a scholarship to enable a young woman to learn to fly was taken up. In recognition of Amelia’s exceptional achievements as an aviator, this flying scholarship of $2750 enables a local woman to achieve solo status. It brings together the best of what Marlborough has to offer, a first class flying school, a world class Aviation Heritage Centre, a supportive and caring community, and the opportunity for a woman to realise her dreams and learn to fly. Additionally the Marlborough Aero Club provides one year membership in the club and a pilots logbook; the NZ Association of Women in Aviation gives one year’s membership for support and mentoring. In 2012 to add further interest in promoting this award the Club established a local component of $250. The winner receives the award from the Mayor at an afternoon tea in the Mayoral Chambers. 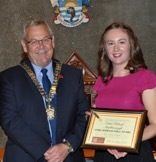 In 2015 Marlborough was able to select an excellent applicant for the Young Women in Public Affairs Award. Rosie Argyle responded to our poster circulated at the Marlborough Girls’ College. Later she asked for our comment on her speech to be given in the Market Square on Suffrage Day 2014.
elped her achieve. winner with the Zonta Club’s award. In response to frequent requests for information specific to our club, we produced a “new and prospective” member brochure. This outlined where and when we met, what the responsibilities of membership entailed, the cost of subs and on-going costs for dinner meetings, events and other matters along with a brief description of the Zonta International three level organisation, mission and activities. It proved most useful and we were pleased that District 16 used it as a prompt to produce one suitable for all clubs to use. Friends of Zonta was established as a circle of previous members and others who opt to be involved and for $10 they would be sent the Club’s newsletters so they could be kept up to date with coming events and give offers of help when they could. This continued until it was realised that almost all of them had an e-mail address, so the fee was dropped and the newsletters sent electronically each month. Now there is only one for whom we need to print off a copy!